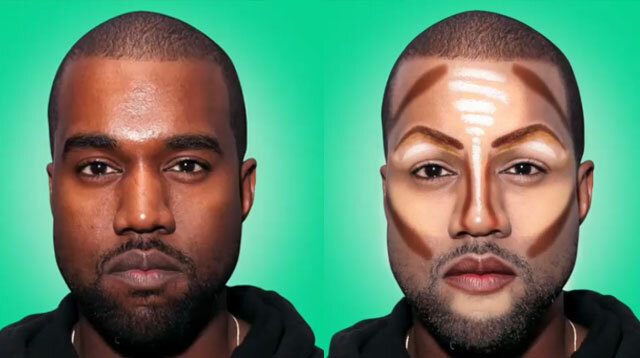 What If Kanye West Tried Contouring? We might as well officially dub Kim Kardashian as the queen of contouring. While she may have not pioneered the technique, it was her rise to superstardom that drew more attention to the age-old makeup trick. Now we’re all obsessed. Or at least very curious about the trick, since it could instantly #bless you with the facial structure of your dreams. Today, we found this oddly hypnotizing time-lapse video by artist Saint Hoax of what Kim’s hubby Kanye West would look like if he got the Kardashian *kontouring* treatment. You look really good, Kanye! Better than most of us when we skip contour, even.